Best value! Easy to use! Tangle-Trap Sticky Coating is a clear, brush-on formula that won't mask the red color of your trap. The lid has a built-in brush for easy application. 8 oz. coats 16 red spheres. 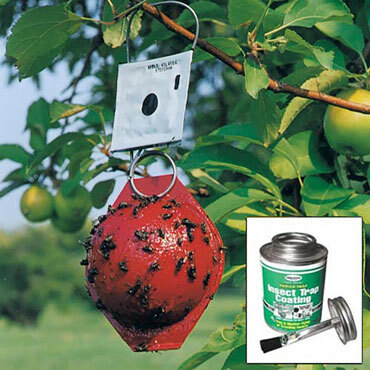 Apple-scented lures increase the catch of adult maggot flies by up to 20 times! Lures keep indefinitely in packaging if refrigerated. Order Tangle-Trap Sticky Coating and Apple-scented lures separately.